In years past, I’ve been a part of a Secret Santa party with a bunch of Pasadena folk. To ennerdify the proceedings a bit, I volunteered to make a web site that would automate the task of drawing the Secret Santa names out of a hat. This, apparently, put me in charge of the whole party… in saecula saeculorum. This year, I decided to abuse that power and completely change the rules. Instead of Secret Santa, we’d be celebrating the holidays just like the magi did: showing up late with questionable presents. 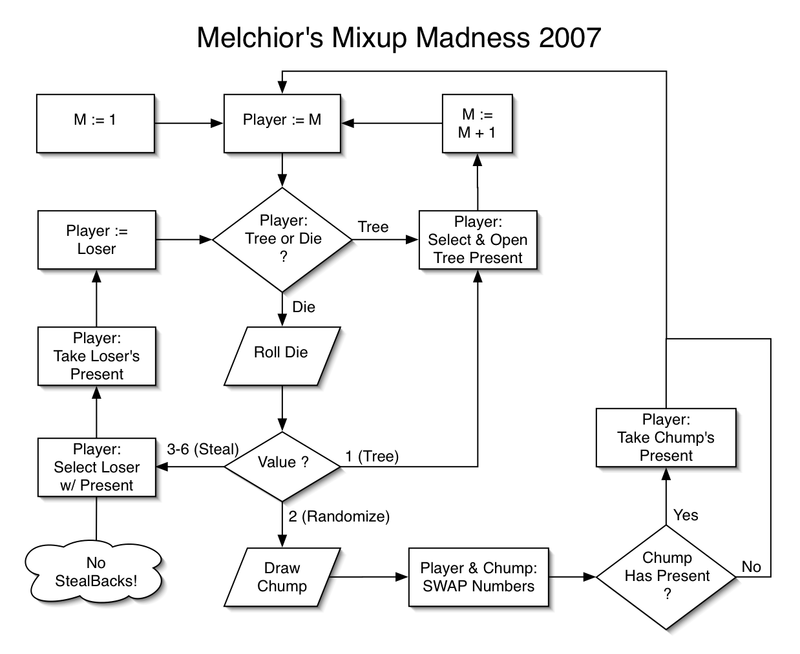 Melchior‘s Mixup Madness was born, and it was born in the holy form of a White Elephant party: everyone brings a gift and the presents are doled out over the course of a game involving lots of backstabbing and treachery. 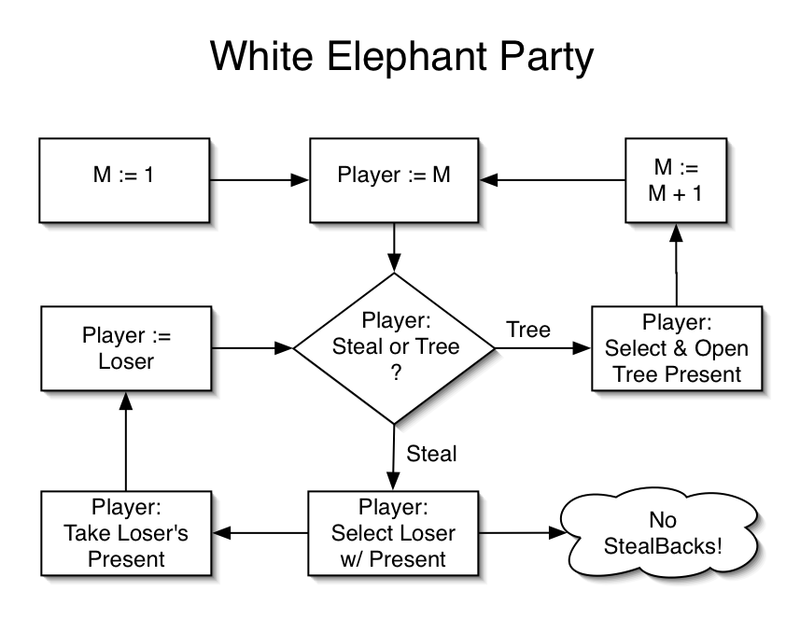 Here’s a basic flowchart showing two things: the traditional rules of a White Elephant party and that I am a giant nerd. The first person to go opens a gift, the second person can open a new gift or steal the first person’s gift, and so on until all the presents are opened. Note that I’m using := as the assignment operator, that M is an index ranging from one to total number of people playing the game, that M indexes both the people playing the game and what “round” of the game is currently being played, and that (though no start and end are explicitly shown) we start at M:=1 and end when all the presents under the tree are opened. Greg, Paul.za, Michelle and I identified a few problems with this setup, though, while we were planning the party. The person who goes first doesn’t get to play the game much unless he or she happens to open a popular present. The last person to go has the most information about the presents and so can make the best choices. Even with no stealbacks, there is the possibility of entering an infinite loop (for certain definitions of “stealbacks”). Artificial rules must be introduced to break that possibility (imposing finite limits on the number of times a particular present can be stolen, on the number of times a particular person can steal, or so forth). The Decemberists were playing at the Hollywood Bowl on July 7th (several weeks ago), and Michelle and I got cheap tickets. They put on a really good show. Very engaging and energetic. I also really dug Andrew Bird and his Leslie-like cartoony speaker setup. His live performance, though, was head and shoulders better than his Armchair Apocrypha album I got off of iTunes after the concert. The crazy part of the evening, however, was meeting Morena Baccarin. Wait, what? Yeah, she was at the Hollywood bowl and, after a double take, I asked for a picture. She was super nice and graciously agreed. It was my first opportunity to interact with a celebrity in LA despite all the small world stories you hear from here and my living in the area for the past four years. Seeking adventure, Michelle and I drove up to Montrose, California to check out the scene and have some lunch. Having heard of (googled) its reputation, we decided to eat at the Black Cow Cafe (terrible website). It was awesome: Pleasant ambiance and really good food. Apparently it’s the place to eat brunch, so the staff was a little swamped, but we were seated and served fairly quickly. I highly recommend the Banana Bread French Toast; totally amazing. Michelle really enjoyed her omelette and even finished her whole breakfast! Having the excuse of a Wedding to attend in Mobile, Michelle and I decided to make a trip out of it and see some things this Idaho Yank had never seen (“Idaho Yank” seems to me to be something of an anachronism since Idaho was admitted to the Union many years after the end of the War of Northern Aggression. Besides, the Mason-Dixon line doesn’t extend nearly that far West geographically or, arguably, culturally. But whatever.). I had a debate with Michelle the other day that started with me making the statement above. My argument was that artists are going to spend a long time composing and brooding over a work of sadness because they have nothing better to do; they’re sad. A happy song, however, will be written quickly; the artist has better things to be getting on with. Now, I know there will be many who disagree with this assessment (or the conclusion), so allow me to seal the deal by offering up a concrete example grounded in objectivity that will surely convince even the most fervorous of dissenters: Elliott Smith v. The Village People. As long as nobody brings up Belle and Sebastian, I think we’ve got that all settled. Depending on whether or not someone else grabs it first, I may have an extra ticket for the Death Can for Cutie and Spoon concert tonight at the Greek Theatre. Get in touch with… Greg or Ellen or Paul.za if you want it (or me by phone); I’m at the beach today. My mom and dad, Allen, Michelle and I went up to Orcas Island this past weekend to celebrate Lincoln and Chana’s marriage. It’s a really nice place. Besides the wedding activities, the whale watching trip we all took was the highlight of the weekend. Saturday morning, we headed to Rosario Resort‘s docks and climbed aboard Deer Harbor Charters‘ whale watching vessel Pelagic. Once aboard, our guide, James, talked about the orca whales’ history and behavior and pointed out other local wildlife (bald eagles, porpoises, seals, etc.) as we cruised out to sea. About an hour and a half after leaving the docks, we spotted our first orcas a hundred meters or so off the boat. Soon we were surrounded by whales, though none was particularly close. When feeding, an orca pod apparently tends to spread out unless one of the whales finds a large group of fish. We motored around a bit to try and get a better view when a group of about six whales to starbord and aft started swimming (quickly) right toward us. Every ten seconds or so, a few whales would surface: each time a little closer. Finally, one whale surfaced about eight meters from the boat. Everyone scrambled to take pictures, but a feeding orca is not above water for very long. Just after it resubmerged, two more whales surfaced literally within one meter of the boat and dove underneath us. We saw them up close and, man, are orcas big. After that, those several whales hung around us for five or ten minutes; we were apparently right above their chosen fish. I got a couple pictures but nothing as spectacular as being there in person. Hopefully someone else was a better shot. The tour lasted about three and a half hours (Allen said he had the Gilligan’s Island theme stuck in his head the whole time) and was a lot of fun. That afternoon, we drove up to the top of Mount Constitution in Moran State Park. My great grandfather was in charge of the CCC‘s construction of the stone tower at the peak of the mountain, so it was something of a familial pilgrimage. The view from the top is spectacular, and we could see tiny little whale watching boats down on the water. Indeed, with binoculars, we could see the whales the boats were watching! Seeng whales from two feet was more exciting than seeing whales from two thousand feet, but both were a lot of fun. I saw Superman Returns last night with Greg. Superman’s character makes for a difficult movie. He fights for truth, justice, and (more controversially) the American way, he never lies, he’s essentially invincible, and he’s well loved by society. Other than his alter ego’s bumbling awkwardness, he has no character flaw and has only one weakness: kryptonite. So how do you go about making a meaningful movie with such a two dimensional character? The only inner conflict at our disposal is Superman’s departure and return (implied by the movie title) and the possibility that he gets fed up saving the world every time Hollywood calls upon him to do so.